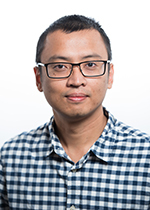 Dr. Nugraha is a coastal modeler expert in the Department of Energy’s (DOE) Pacific Northwest National Laboratory (PNNL). Dr. Nugraha research covers broad areas, including integrated modeling assessment of impacts of climate change and extreme events on coastal infrastructure, nearshore restoration, marine ecosystem (i.e. phytoplankton, zooplankton and eelgrass) and water quality modeling, estuarine and coastal hydrodynamics, sediment transport and bed morphology, and biogeochemical (carbon, nitrogen and silica) cycle in ocean and estuaries. Dr. Nugraha is the key modeler for the development of hydrodynamic and transport model of Salish Sea, and he has long term experience in oceanographic data analysis, signal processing and parameter identification. Dr. Nugraha has also involved in several projects related to data measurements and real-time monitoring of water quality and oceanographic parameters. Czamanski M., Nugraha A., Pondaven P., Lasbleiz M., Masson A., Caroff N., Bellail R., Tréguer P. 2011. Carbon, nitrogen and phosphorus elemental stoichiometry in aquacultured and wild–caught fish and consequences for pelagic nutrient dynamics. Marine Biology 158: 2847–2862.